As an endangered species, wolves are protected in Washington State by the federal government. But the state has the right to “remove” them if they start to impact the interests of cattle ranchers. In this case, the rancher, Len McIrvin, who leases grazing rights in the Colville National Forest, placed salt licks right next to the wolf den, thus putting his cows at risk. This is a story about what goes wrong when well-meaning animal advocates make deals with the devil and get into bed with businesses and agencies that don’t have the interests of the animals at heart. Two weeks ago, the Washington Department of Fish & Wildlife ordered the killing of an entire pack of wolves. The wolves had killed some cows who were grazing on public lands, and last I heard, the hunt was on for the last remaining adult wolf, who was still struggling to provide for her four pups. You don’t have to be a conspiracy theorist to speculate that McIrvin did this deliberately in order to provoke the outcome he’s now achieved. The authorized removal of wolves in the Profanity Peak wolf pack in northeast Washington is deeply regrettable. The Washington Department of Fish and Wildlife is however following the protocol developed by the Washington State’s Wolf Advisory Group, a diverse group of stakeholders. By “authorized removal”, they mean, of course, authorized by themselves. These very groups had sat down with the ranchers, state agencies and other “stakeholders”, and agreed to protocols by which the state would be “authorized” to kill wolves. The justification now offered by these so-called animal protection groups is that it has given them “a seat at the table” to be part of the negotiations with the ranchers. This has been a tough week for wolves and those of us who are committed to their recovery. … While the authorized removal of the Profanity Peak wolf pack is a distressing loss to process for all of us, we strongly believe that this tragic situation will not undermine our overall goal of achieving wolf recovery in Washington State. The simple fact, however, is that when you make deals with those who exploit animals for personal gain, you inevitably become party to more cruelty and more suffering. It’s always the case, whether we’re talking about deals with the factory farm industry, the vivisection industry, the pet-breeding industry, the hunting industry – all of them. In order to be allowed to sit down with them in the first place, you have to accept the basic assumptions by which they operate. In the case of the ranching industry, those assumptions include that personal profit takes priority over wildlife, and that grazing cattle on public land is an unquestioned right, even a sacred right. But there’s nothing sacred about the cattle industry or the enormous subsidies it collects from Congress, courtesy of the U.S. taxpayer. 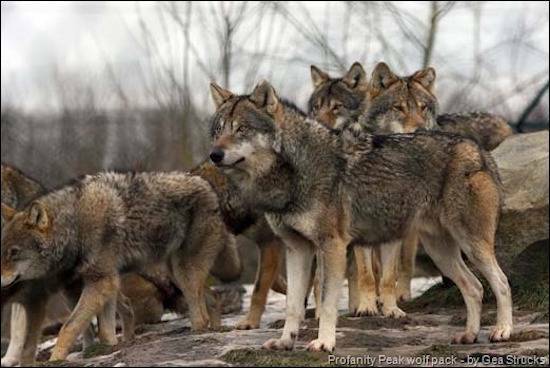 Nor is exterminating an already endangered wolf pack an “authorized” necessity. Rather than making Faustian bargains by which they inevitably forfeit their souls, advocacy groups like Defenders of Wildlife and the HSUS would do better to stand their ground and spend their time and money actually defending the wildlife they claim to represent. * In a Seattle Times op-ed, filmmaker and advocate Brooks Fahy exposes how the ranching industry uses the mythology of the lone Western cowboy to fuel its parasitic business model. Most ranchers don’t want to spend time and money guarding [their cattle]. Why should they? They know the government will come in and kill predators on the taxpayers’ dime. They also know they’ll be compensated for their losses, and many ranchers now consider these handouts a right, not a privilege. No other industry has been more adept at externalizing their costs. Conservation biologist Adrian Treves explains the flaws in the belief that killing more wolves leads to less predation of farmed animals. While removing carnivores to ease livestock loss sounds like it makes sense, research suggests that coyote populations subjected to culling have higher pup survival rates, and that male cougars expand their ranges in response to hunting. Guard dogs and other deterrents are more effective.